Premium water based roof paint with long lasting formula. 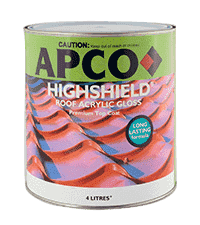 Highshield Roof Acrylic is a water based finish for protection of roof and roof tiles. The product is also available in Tonga, Solomon Islands and Vanuata. Before painting, remove dust, dirt and grease from the surface to be painted. If mould or fungus is present on the surface, wash it with a commercially available bleaching agent and then treat with anti-fungal solution. For weathered galvanised iron and zinc alume apply Metalprep Interior/Exterior Galvo Enamel Primer. For bare steel, apply one coat of Metalprep Interior/Exterior Enamel Primer. 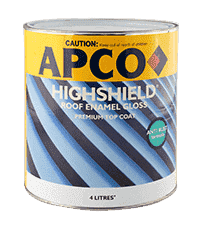 Apply two coats of two coats of Highshield Roof Acrylic Gloss with an interval of 3-4 hours between coats using brush or roller or spray.